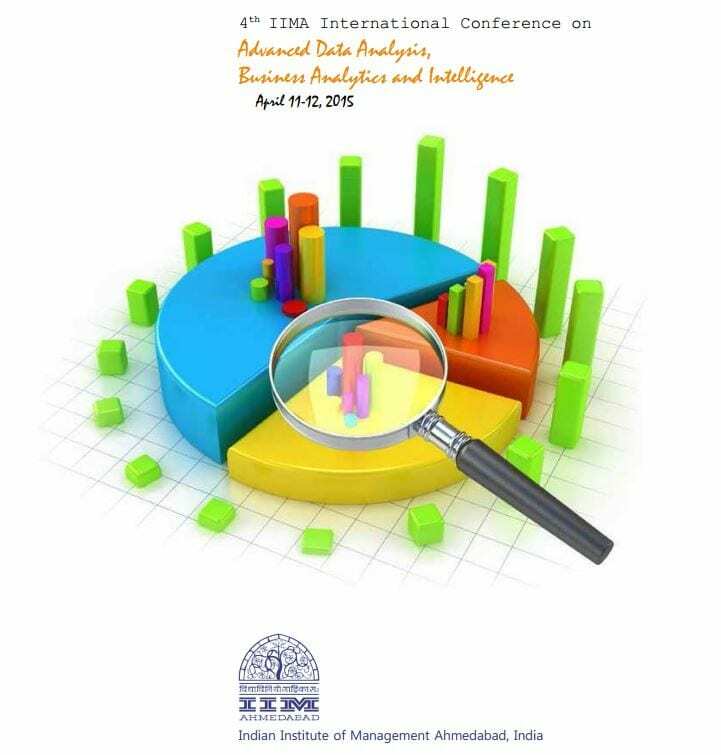 Indian Institute of Management Ahmedabad is happy to announce the 4th international conference dedicated to advanced data analysis, business analytics and business intelligence. Case studies and novel business applications of tools and techniques of advanced data analysis, business analytics and business intelligence among academicians and practitioners. Research: Does the paper compare and weigh the material against the work of others? Managerial Implications: Is the managerial relevance and implications of the decision problem demonstrated? Registration fee of Indian Rupees (INR) 19,000 should be sent latest by February 14, 2015, through a demand draft/ banker’s cheque in favour of Indian Institute of Management, Ahmedabad, payable at Ahmedabad. For participants affiliated with academic institutions in India a fee of INR 9500 is applicable. Registration fee will include conference dinner, lunch and tea for the conference days, and conference materials. Registration forms can be downloaded from the conference website www.iimahd.ernet.in/icadabai2015/ . The registration form should be sent along with the demand draft. To encourage bright young researchers in the field of analytics, some participants of the PGPX Batch of 2008 has instituted “Best Research Paper” awards. Each Award would consist of a cash prize and a certificate of merit. A committee of academicians and industry experts would judge the papers and decide on the awards. Only full papers submitted on or before 1st February, 2015 will be considered for these awards. The paper must be presented by the author or one of the author(s) in the conference. The awards will be given during the Valedictory session of the conference on 12 April 2015. Author(s) interested in their papers being considered for the awards should explicitly state the same during the submission of the Abstract which is due by November 14, 2014. “Analytics-Driven Organization” - The time is now! !